February 21, 2018 | At the risk of sounding like a finance-obsessed Chicken Little: the next crash is coming and the warning signs are here, especially after this month’s dismal stock market display. Of course, this is no Nostradamus-level divination; market booms and their requisite busts are a fact of life. However, what is important is that the next storm is brewing. The looming crisis is eerily similar to 2008, with a dash of the 2000 Dot Com bubble. In short, there are several worrying areas of the economy right now, of which the following I will focus on: the stock, bond, and housing markets. The stock market bubble is straightforward. This bull run is long overdue for a ‘correction’, and last week’s performance is indicative of the massive overvaluation of the market. In a way, it is akin to 2000’s Dot Com bubble, full of overvalued tech companies with little to show for in the terms of fundamentals. Take for instance Snap, the company behind Snapchat. Snap’s stock, $SNAP, shot up from $13.50 a share to $17.25 a share—about 26% over the course of the day—upon the release of its Q4 financial report recently. How good was this report? Analysts were expecting them to report a loss of around $409 million, but they instead managed to report a loss of ‘only’ $350 million for the quarter. Fantastic news. Now, there are multiple abstract reasons one could attribute to their continued stock market success—perhaps, for instance, Snapchat is the new Facebook-killer, a platform for Gen Z and thus having more intangible value—but those metrics are not captured in the raw data. Regardless, stock market fluctuations are not the only, nor the best, indicator of the economy’s future health. What tells a better picture is the yield-curve on U.S. Treasury Bonds. Without getting too technical, these yield curves are a great predictor of future economic downturns based on the Term Structure of Interest Rates. Broken down, there are three forms of the yield curve on US Treasury Bonds—normal, inverted and flat—each signaling different economic times. Normal yield curves (i.e. upward sloping) indicate yields on longer term bonds are beginning to rise, signaling investor confidence in the economy going into the future. Conversely, an inverted yield curve indicates that interest rates on long term bonds may continue to fall, which corresponds to periods of economic recession. Finally, flat yield curves indicate an economy transitioning from expansion to lower growth and possible recession. This is exhibited by yields on long-term bonds beginning to fall and yields on short-term bonds beginning to rise. 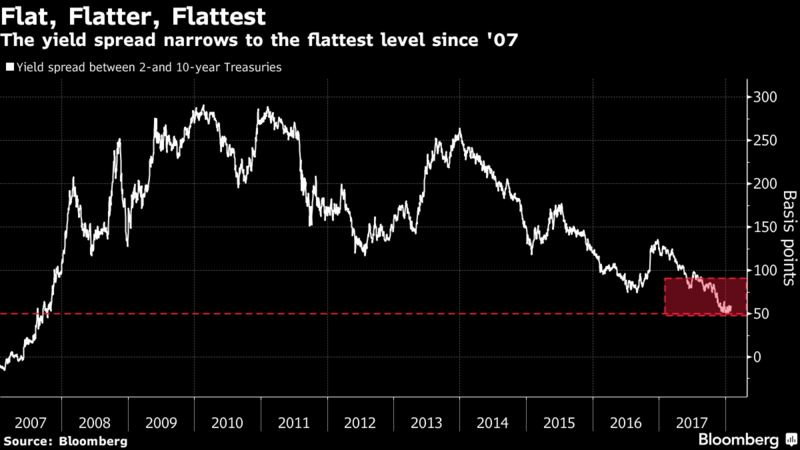 This flat yield curve is precisely what the bond market is becoming now, getting to its flattest level since 2007. Finally, the housing market is beginning to overheat. A couple keys signs can be found in the Case-Shiller national index, the SPDR S&P Homebuilders ETF, and the resurgence of “No Doc” or NINJA (“No Income, No Job, No Assets”) mortgages. The Case-Shiller national index, an index of housing prices, has reached historic highs—the last time it had been so high was right before the crash. The SPDR S&P Homebuilders ETF is up 400% since its post-crash lows, performing much better than the broader S&P 500, which is up 270%. Finally, no doc or NINJA mortgages are back from the dead. Anyone who has studied the subprime mortgage crisis knows that these words are synonymous with dangerous deregulation. These mortgages are wildly high risk, broadly requiring not much else besides having a heartbeat and a complete mortgage application. These are precisely the kind of subprime mortgages that led to massive defaults and the resulting crash that we are all so painfully familiar with by this point. All of these taken together point to a looming financial crisis. In the recent words of former Federal Reserve Chairman Alan Greenspan, “We have a stock market bubble.” Indeed, the two historic drops in the stock market last week are troubling. Some analysts have attributed this to fears of rising inflation after a solid January jobs report and recent interest rate increases by the Fed. To the skeptical eye, however, these reasons are questionable and spurious to attribute as the sole cause behind these market fluctuations. Inflation rates have oscillated around 2% since an average annual low of 1% in 2010. Indeed, the last major hike in inflation rates was during the period of 2010 to 2012. Furthermore, the Federal Reserve announced its latest and fifth interest rate increase since the 2008 financial crisis last December—increasing the benchmark federal funds rate to a new range between 1.25% to 1.5%. An increase, but hardly a meteoric rise—not to mention one announced far in advance of this recent panic. This monetary policy is done in part to temper overheating in an otherwise expanding economy and maintain price stability, especially after recent expansionary fiscal policy by the GOP. Indeed, this expansionary policy is coming at a bad time, if one subscribes to basic Keynesian macroeconomics. Usually, fiscal stimulus is best implemented counter-cyclically: cutting taxes and increasing spending during recessions to help the recovery and increasing taxes and cutting spending during expansions to reduce severity of a bubble. In the words of Paul Krugman, the policy is “not good—it means higher debt, which will in turn reduce the “fiscal space” for responding to the next crisis. It will also crowd out investment, hurting long-run growth.” This isn’t to say the GOP Tax Bill will cause the next recession, but it will give policymakers fewer tools to tackle it. Taken together, one should be concerned with those arguing that this market is just at the beginning of its bull run. As it stands, there are deep structural issues with the economy that have been unaddressed since the previous crash, and unfortunately the usual suspects of the last crash are back in full stride. This is not to say that it is time to start burying gold in the backyard and to go off the grid, but it is the time to be prepared for the next crisis and to not get swept up in the “animal spirits” and blindly over-invest in risky ventures like in the late 1990’s and mid-2000s. Remember these words: the Bear Market is coming. Drake MacFarlane is a graduate of Lewis & Clark College's economics program and a fraud analyst in Portland, Oregon. Image by Drake MacFarlane under fair use.